Dr.Munir Ahmed, Homeopathic Education Researcher is active in the area of simplifying homeopathic education. Training of homeopathic teachers in educational science and technology as applied to homeopathic context is the pioneering effort that is going on for the past five years. These teacher-training workshops help the teachers to systematize teaching effectively, evaluate students objectively and plan syllabus with societal and ideological commitment. He is a Professor at Government Homoeopathic Medical College, Bangalore. 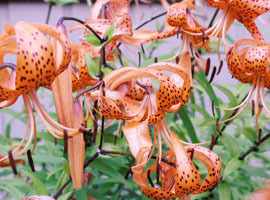 The Tiger Lily, enjoyed reputation for medicinal value in ancient China and Japan. The Tiger lily has orange flowers covered in dark spots and stripes, which give the vague impression of a tiger skin. Because of its attractive feature, it has become popular as ornamental plant. This medicine is popularly used for female complaints and heart conditions. However, the personality of Lilium tig is something that is not extensively appreciated for prescription as a constitutional medicine. This article makes an effort to project the mind and emotional feature that offers a different dimension of Lilium personality. the virtuous path is more pronounced during sexual excitement or activity. wants to keep busy otherwise to stay away from sexual thoughts. Therefore the sub-title – the penitent ‘saint’. It need not be a saint or a religious person. Any person who feels repentant for having given priority for the sensual feelings over the moral obligations, be they social or otherwise will fit into this remedy persona. Lil. tig was introduced into homeopathy as a full-fledged medicine by the joint efforts of W. E. Payne and Carrol Dunham. 4. menses – too early, scanty, dark and offensive.